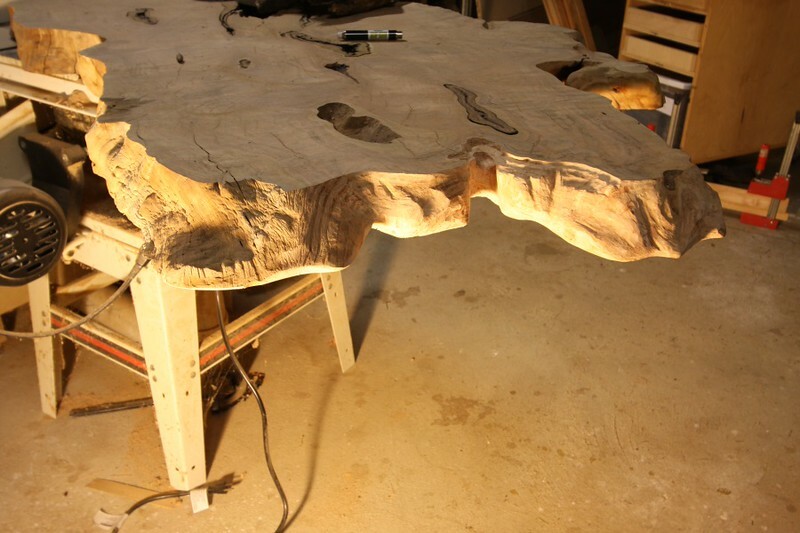 The process of turning a slab into something that will last a lifetime is a complicated process that can involve many steps. 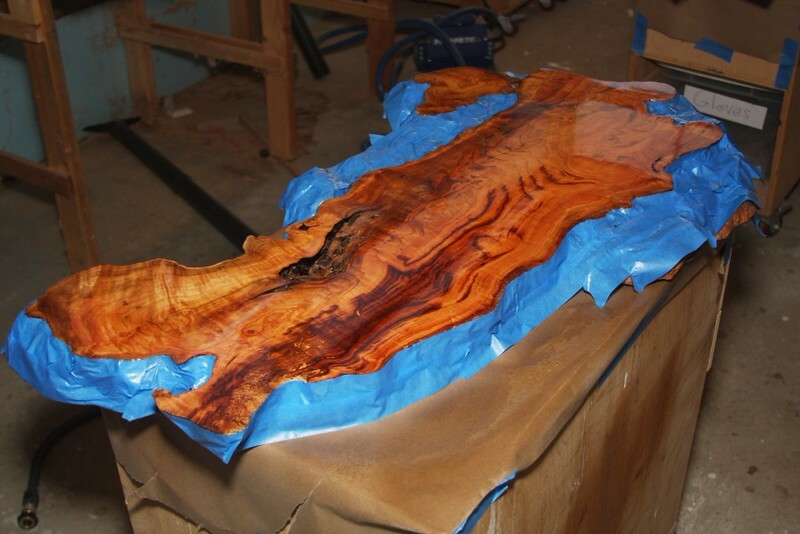 Here is a Cherry Slab that was cut into two pieces, and ended up being two separate tables. This is how the slab started. Upon house visit and measurement, size needed was 48" long, requiring a cut. 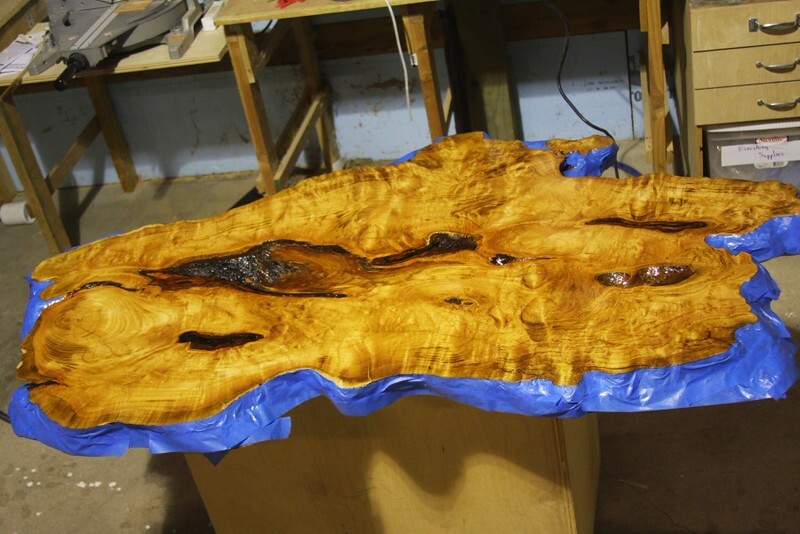 Cutting into such a beautiful slab is never easy, and the cut was done with an intent of fabricating a live edge that would match the rest of the slab. 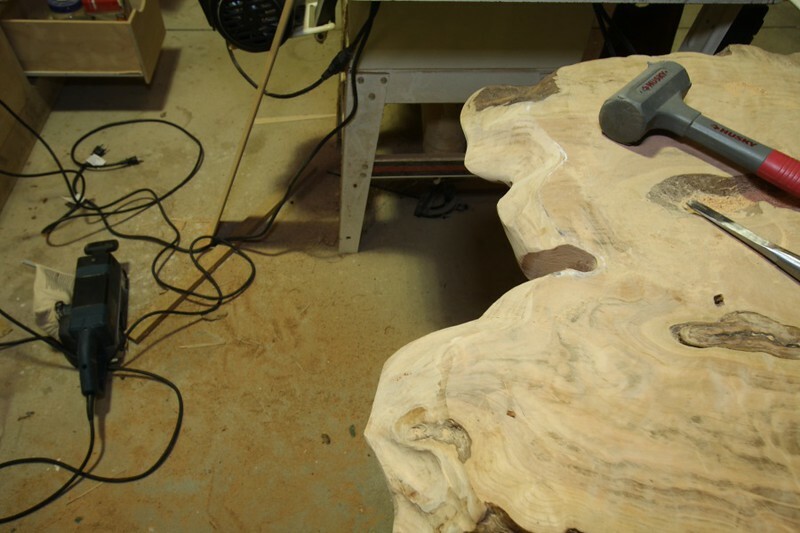 The cut was not as dramatic as what was needed, and additional cavities and undulations have been created as a starting point. 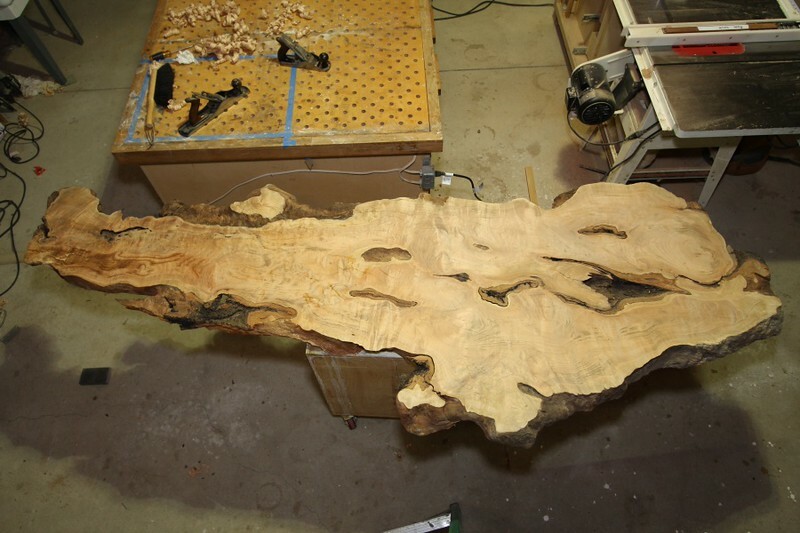 This is after many hours of carving and adjustments, carefully matching the surrounding grain pattern to create that "live edge" feel. 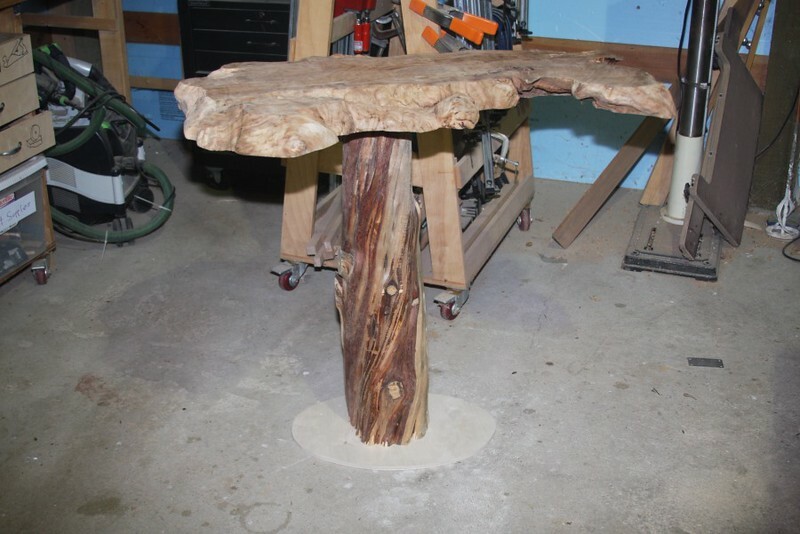 The customer selected a juniper base which was not sturdy enough on it's own. This was a test to find the appropriate length of required leg extensions to provide stability to prevent tipping. 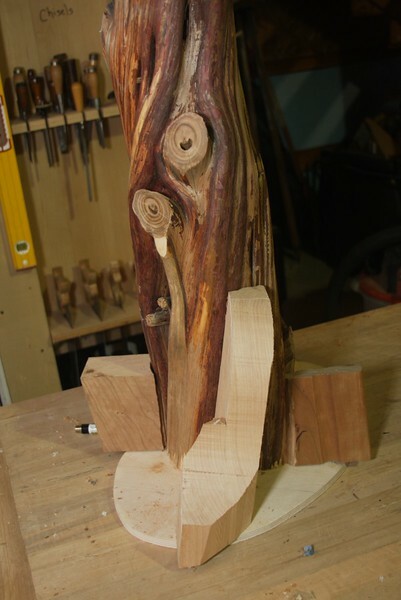 Cherry was used as the material for the leg extensions, which were shaped and then mortise and tenon joinery was implemented to attach these firmly to the base. 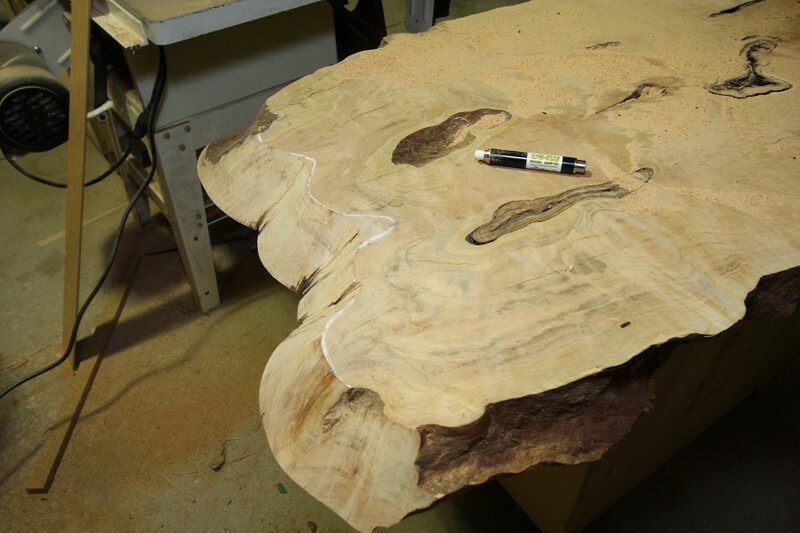 It was desired to have the edge be rougher than the top. The finish used was a high gloss finish. The edges were protected so they could be finished separately, creating a nice contrast between the top and the edge. the gloss finish was hand-rubbed to create a smoother-than-glass satin finish. A custom 1/2" thick piece of glass was cut to an oval shape to cover the voids. When the cut was made, it created two pieces. 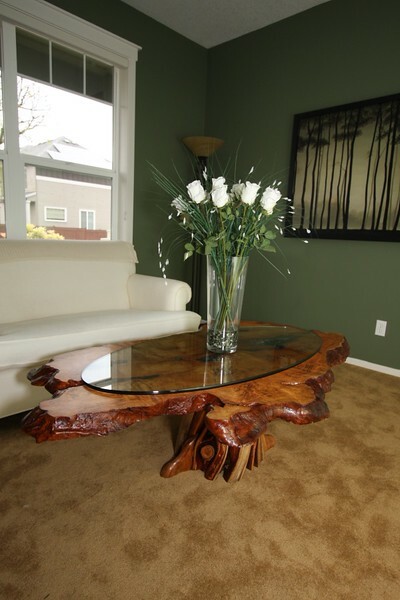 Here is the shorter piece which would evolve into the entry table. 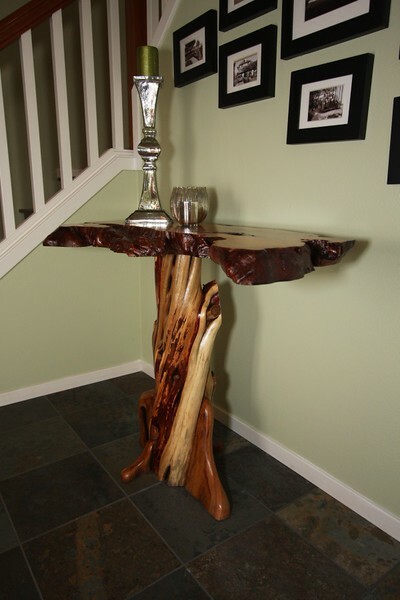 With such a taller base, this entry table would be prone to tipping. 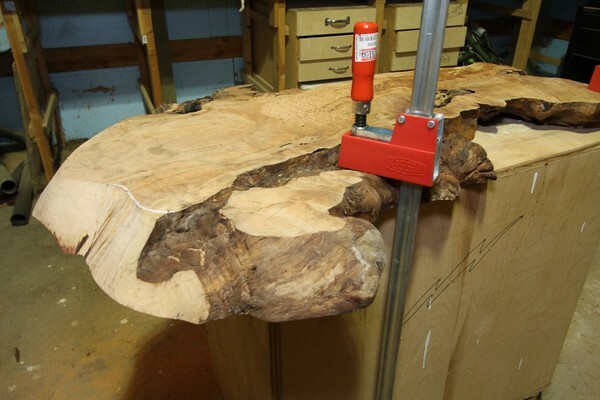 This was a dry fit test to find the right dimensions required to support the table without tipping. 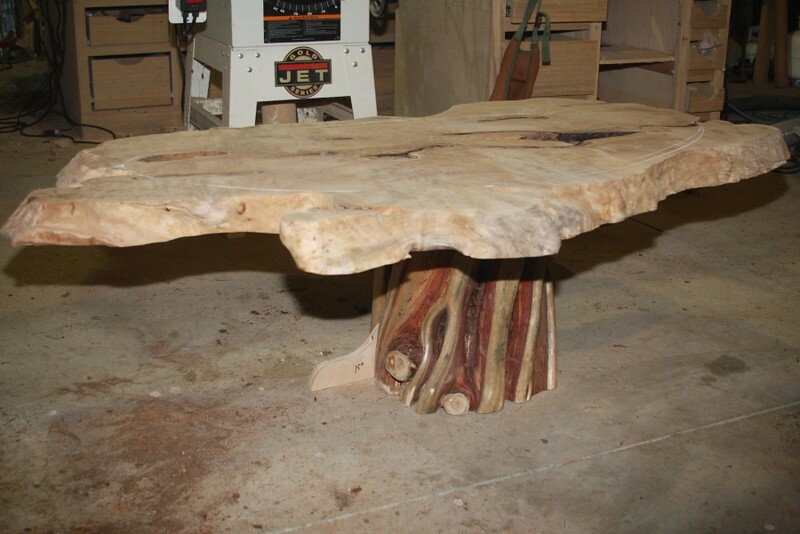 As with the coffee table, the edge was finished seperately from the top to create a nice contrast. 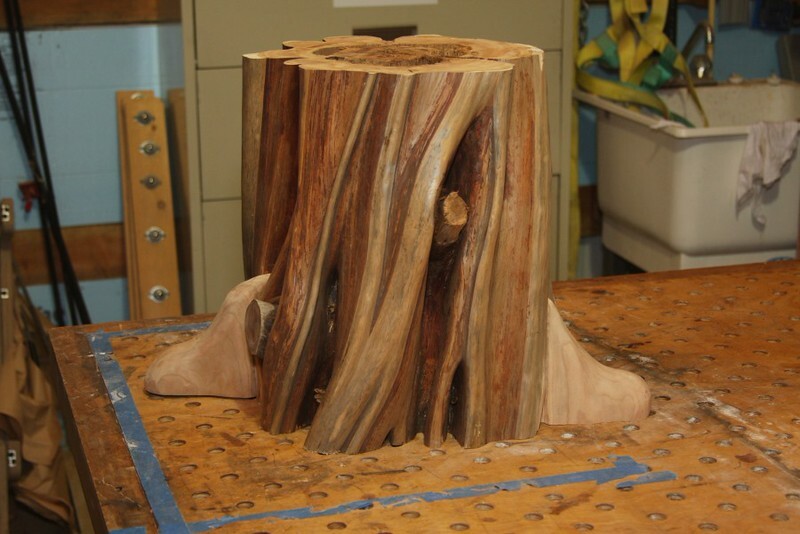 The cherry was roughed out to begin remove the majority of the wood necessary for the final shape. 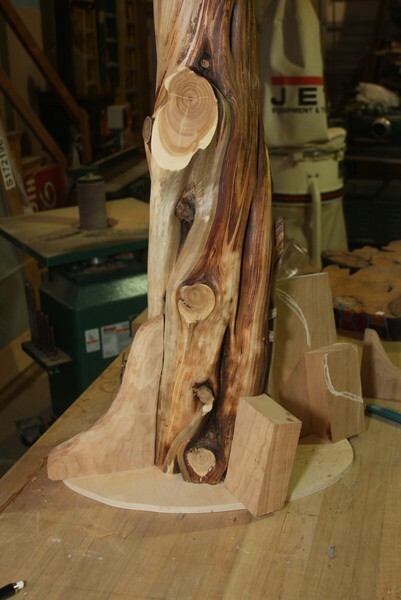 Cherry was used and mortise and tenon joinery was utilized to join the legs to the base. These were then hand-shaped to their final shape. 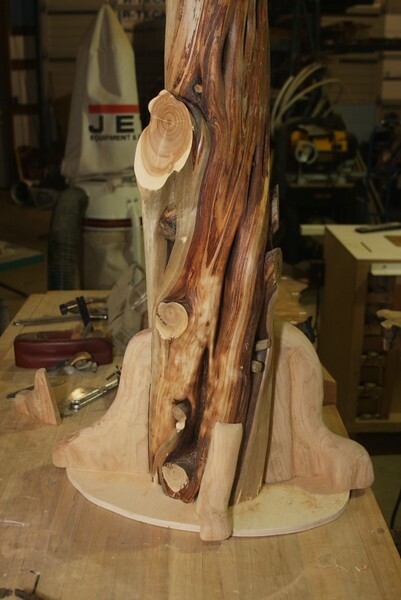 The legs were slowly shaped to their final figure, each one custom fitted to each side. 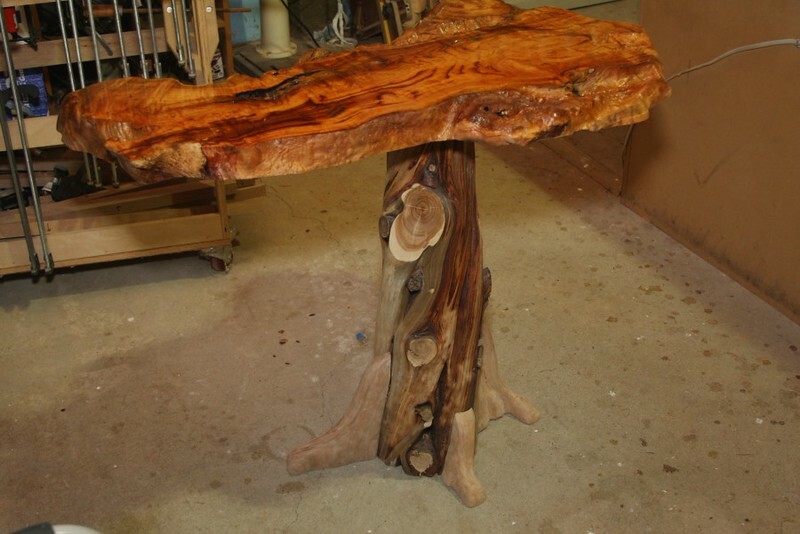 This was a dry fit to ensure the base & legs were acceptable to the customer prior to final finish. 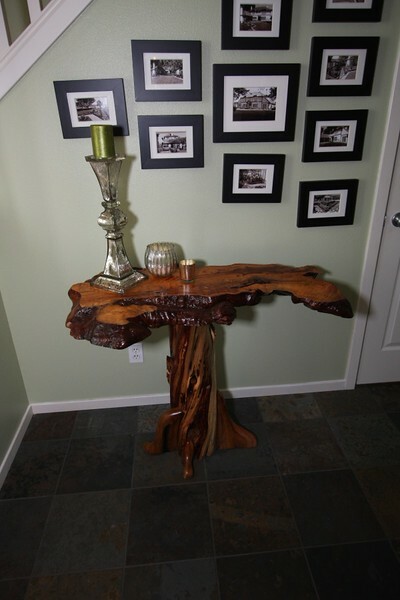 Here is the finished entry table at the customer's house. You can see how the legs were matched to the twisted orientation of the juniper.